Native plants, soil, and living beings from tiny organisms to charismatic wildlife are interconnected with the essential cycling of air, water, and nutrients. This includes absorbing pollutants, carbon, and other greenhouse gasses, infiltrating water, reducing flood hazards and soil erosion, and continually creating materials that nourish, shade, cleanse, and enrich the world around us. We breathe the breath of plants and organisms, and the red of our blood comes from iron through the food we eat. 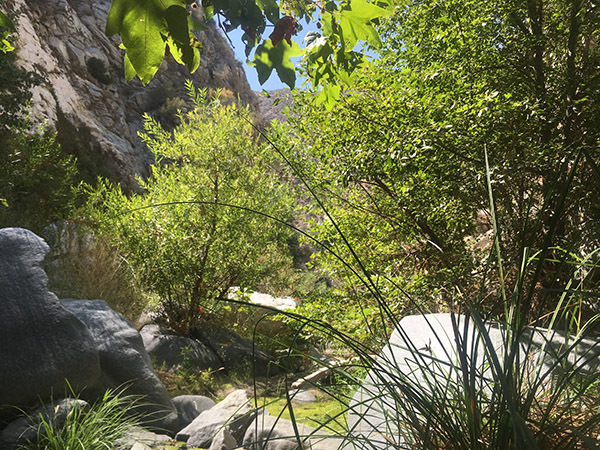 The Los Angeles Region is part of a recognized biodiversity hotspot for both our impressive diversity of species and the significant challenges that they face. The State of California is home to nearly 6,000 native plant species alone, about 30% of which are endemic, which means this is the only place where they are naturally found. We are part of what is known as the California Floristic Province which stretches from Oregon down to Baja California—from the Pacific Coast east to the ridges of the Sierra mountains and the Transverse Ranges, including the San Gabriel Mountains to the north of Los Angeles. Much of our local biodiversity may be attributed to our Mediterranean climate and east-west oriented mountains. Our climate of mild, wet winters and warm, dry summers is shared with just five other regions in the world, which together make up about 2% of the earth’s land area, but 18% of all the known plants on Earth. This is all the more exaggerated in the Los Angeles area where our quickly-growing mountains are not only tall, catching rain and creating many kinds of habitats from the coast to the highest peaks—but the east-west movement of the sun across their ridges, canyons, and streams results in more different amounts of shade and sun exposure than in more common north-south oriented ranges. This has resulted in many more different kinds of places for different plants and animals to live. The California Floristic Province is also significant for the Pacific Flyway for birds traveling between North, Central, and South America, and for other migratory species such as monarch butterflies that depend on places to visit and rest here over the courses of their lives. 90% of the insects that eat plants can develop and reproduce only on native plants, and most wildlife is dependent on these insects (Tallamy 2007). Even more generalist species can suffer from non-native plants, for example monarch butterflies that do lay their eggs on non-native milkweed plants are more vulnerable to disease. Planting and protecting native plants is essential not only for respecting and cultivating our natural heritage, but also to support and conserve species and local ecosystems. Biodiversity and ecosystem functions are most threatened by habitat loss—human development and non-native species. Invasive species present the biggest of the non-native threats. The California Invasive Plant Council (Cal-IPC) lists these exotic invasive species. Protecting existing areas, reducing paved areas, planting and supporting native plants, and avoiding the spread of exotic invasive species are among the best ways we can support wildlife and ecosystems. Some ecosystems in our region are more rare and vulnerable than others. We have built over an estimated 95% of all wetland habitats—creeks, streams, rivers, marshes, wet meadows, and alluvial fans. Beyond just being scarce, riparian areas are foundational corridors in arid regions supporting many species across land cover types, more than any other habitat. These habitats are critical for local ecosystems and also cleanse and infiltrate more water, absorb more carbon, and cool more than other habitats. Protecting and restoring them is key for regenerating and sustaining our living systems.